I got The Name of the Star a long time ago, but put off reading it. I haven't been in the mood for paranormal lately. And I keep forgetting that it's on my shelf. I finally picked it up recently and adored it. First off, if you're a contemporary fiction fan, you'll love this book. It is a paranormal since Rory "I see dead people" Deveaux has a near-death choking experience that allows how to interact with ghosts. However, much of the book feels like a typical boarding school book. And who doesn't love boarding school books?! It's about Rory getting used to boarding school life, making friends, studying hard, and observing the British. It shifts to be a thriller later on, but the contemporary base made the book feel like everything that happened was possible. The story gets deliciously dark as more people are murdered and the police are clearly out of their depths. I didn't find it particularly scary, but I almost never find books scary. As suspense novels go, this was very well done. As I said before Maureen wrote this book in such a way that I frequently forgot that this couldn't actually happen. The Name of the Star is a paranormal, not a paranormal romance. Not to say there isn't romance, but it is not the focus of the story. I loved that. I also loved Jerome, Rory's love interest. He's an aspiring journalist and is enthralled by the murder mystery. He and Rory bond over the fact that they're more intrigued than disgusted by the mystery. It was clear that they actually had things in common rather than being an insta-love situation. Their relationship was extraneous to the plot, but somehow didn't feel tacked on. Perhaps because I quickly came to like Jerome. A few criticisms. First, I thought the fact that Rory's near death experience was from choking during dinner was a little silly. Which is weird because there's nothing funny about choking. It was something about the way that the choking incident was set up that I didn't like. There wasn't enough context and it ended too quickly. Secondly, the book was a bit predictable. I guessed the secret behind several characters' identities and purposes within a page of meeting them. Same thing with the murderer. It didn't spoil the story, but I do like being surprised. Thirdly, I see a love triangle forming. Just hints here and there, but I bet it's coming. 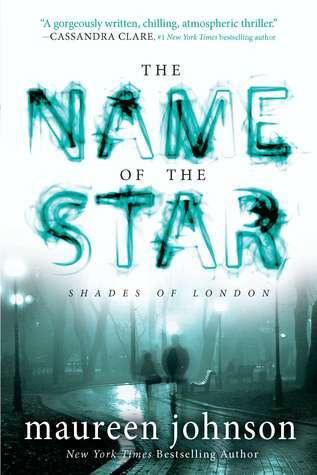 While not a perfect book, The Name of the Star is really enjoyable. I wish I could go to boarding school with Rory and hang out with her mostly drama-free friends. And then go ghost-busting (actually I'd prefer reading about ghost-busting to doing it, but my adventurous side can imagine). Another downside that is entirely my fault: I read the synopsis for the 3rd book and had the ending of the 2nd book spoiled. I'm really irritated with myself and it's actually put me off picking up the second book for awhile. But I will get to it. I wasn't the biggest fan of this one. I think because it seemed a bit lackluster after the first. And, yes to what you said about the choking incident. It just didn't work for me. I put off reading this one for a long time, too, but ended up really liking it. It's not a perfect book, like you said -- still, I found it enjoyable. I just wish the third book in the series would hurry up and come out! I remember reviewing this a while back, and people were really on the fence about it. I, personally, enjoyed it, but I guess I'd hoped it would be a bit more atmospheric and grim, you know? Nevertheless, I definitely enjoyed it, too! Lovely review, Alison! I didn't like this one as much as you did, but then again I had really high expectations and thought it was something entirely different. I did enjoy book 2 much more and it ends on a cliffie. Ugh. I need to read the second book. I read this one. Glad you enjoyed it. I remember really wanting to read this book when it first came up and I read a string of good reviews, but then like you, I kind of forgot about it. I guess at this point I'll wait for the entire trilogy to be released and see what people think of it - but I do love ghost-busting and boarding schools of course! I am always interested in reading anything about Jack the Ripper or really anything about serial killers. I know that's morbid, but I find that stuff interesting. Like why do they they go on these mass murder sprees? I don't know. It's intriguing to me. Looking forward to picking this up to read though! Even added difficult to ascertain are what is frequently referred to as "frankenwatches." These timepieces,which cover Citizens,are accumulated from apparatus of different watch brands.The Rolex Oyster Perpetual is a archetypal watch omega replica that never goes out of style.This is a time section that has been to the acme of Mount Everest,sunk into the Pacific Ocean and broiled to 500 degrees F,and it still looked and performed great.Retail amount for a Rolex is $5,000 to $10,000,so bethink the adage,"You get what you pay for" if your acquaintance tells you he can get you one for louis vuitton replica just $1,000.One of the a lot of affecting realities about online replica handbags is that they are alleged as the affluence artist replica handbags.Replica handbags or actor handbags appeal is ascent these canicule maybe because the abridgement is still down or there are abounding barter that do not wish to gucci replica absorb their money on cher affluence artist brands.Today,these kinds of handbags can be begin just about anywhere there are even accessible in beating off food and arrangement stores.Surely,replica handbags attending like the 18-carat designs of affluence accoutrements that they wish to prada replica archetype or imitate.The decidedly cheaper amount of actor accoutrements is usually one of the affidavit why there are abounding humans abnormally chanel replica the women buy them.Anyway,some replica handbags are superior backpack and a lot of of them are able-bodied fabricated and actor the attending of the branded ones.